Your registration was successfully submitted. You will receive an e-mail confirmation shortly to finalize the membership procedures. In case you don't receive the e-mail confirmation in your inbox please check your junk mail folder. Thank you for contacting Dreamland Aqua Park. كل بطاقة عضوية صالحة للإستخدام كل يوم حتى نهاية صلاحيتها شاملة أيام الأعياد و العطل الرسمية و الإجازة الأسبوعية ( نهاري الجمعة و السبت). دخول سهل و سريع للحديقة. Easy and fast access to the park. No more queue at the admission gate. 15% Discount at the Blue Waves Retail Shop. 15% Discount on Overnight Camping Packages. يحصل صاحب العضوية على بطاقة عضوية خاصة تمكنه من الدخول للحديقة عند إبرازها. لا يمكن نقل العضوية من شخص لآخر بتاتاً وتصلح فقط للاستخدام من قبل صاحب البطاقة فقط لاغير. بطاقة العضوية تخول صاحبها الدخول لمرة واحدة في اليوم. تعدد الدخول والخروج غير مسموح بتاتاً. لا يمكن استرداد قيمة العضوية أونقلها من شخص لآخر . على الأطفال ما دون 12 ربيعاً أن يكونوا بصحبة أشخاص بالغين أو ذويهم لدخول الحديقة وإن كانوا حاملي عضوية. في حال ضياع بطاقة العضوية فإنه يجب إبلاغ الإدارة فوراً وسنقوم بإصدار بدل فاقد برسم 100 درهم لكل بطاقة. أ.عدم الالتزام بشروط وقوانين الحديقة الداخلية. ب.محاولة استخدام البطاقة من قبل شخص آخر. The Annual Pass holder shall be issued an Annual Pass Card to be used for entry into the park. The Annual Pass is not transferable and can only be used by the registered pass holder. The Annual Pass is valid for one entry per day only. Multiple entries are not permitted. The Annual Pass is not refundable and non-transferable. Children under 12 years of age (even holders of a valid Annual Pass) must be accompanied by an adult to enter. Dreamland Aqua Park entrance will be denied to unaccompanied children. Lost Annual Pass Card must be reported immediately to the Park Administration to be replaced for a fee of AED 100.
a. Violation of Park Safety Rules and Regulations. b. Attempted use of the Annual Pass by any person other than the registered holder. 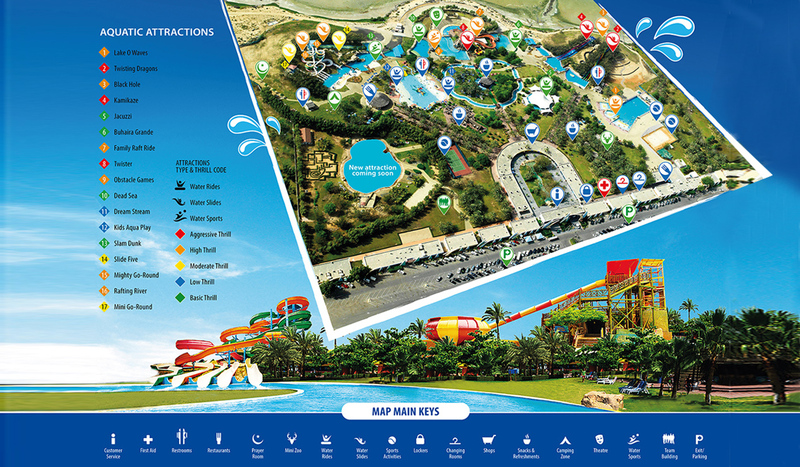 Dreamland Aqua Park reserves the right to reject any application without need for justification. Applications are subject to approval by management of Dreamland Aqua Park. The Family Pass Special offer is for a maximum of 4 members per family consisting of a couple and up to 2 children (12 years and below). Extra Family members and children above 12 years of age should buy an additional Annual Individual Pass. Fridays and Public Holidays are family days. Dreamland Admission, Safety and Conduct codes apply at all times. Proper swimwear is mandatory to use the water rides and attractions. No cutoff pants, shorts, or cotton wears will be allowed in water. Violation of safety rules may lead to expulsion from the Park. Bringing your own food or drinks is not allowed. Be decent and abide by the laws and customs of the UAE. Fridays and Public holidays are strictly for families. ملابس السباحة إلزامية لاستخدام كافة الألعاب والأحواض المائية. يجب التصرف باحترام وفقاً لعادات وقوانين دولة الإمارات. أيام الجمعة، الأعياد والعطل الرسمية مخصصة للعائلات. I also acknowledge that all the above information provided is genuine and correct.